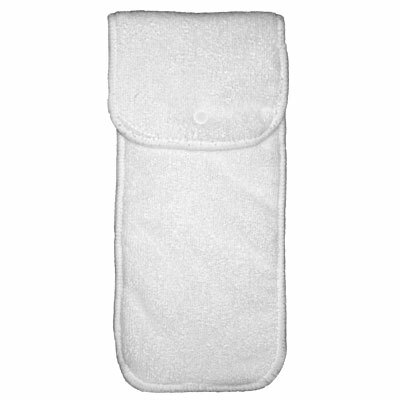 Cotton Babies One-Size Microfiber inserts are made of 3 layers of the thickest microfiber terry available anywhere. A unique snap down design allows these inserts fit perfectly in a small, medium or large Fuzzi Bunz or at any rise setting on a bumGenius™! The new, wider and longer design fills up bumGenius™ and Fuzzi Bunz side-to-side and end-to-end. No more leaks! (Measure 41cm x 14cm unsnapped, or 31cm x 14cm when snapped down). These inserts are manufacturer rated at 15 oz. absorbency. Many other companies offer microfiber inserts, but no other microfiber insert compares to the bumGenius! microfibre insert. What is different? The bumGenius! is simply more absorbent than the others. Click the button below to add the bumGenius! One Size Microfibre Insert to your wish list.